Blizzard says that World of Warcraft could go free-to-play someday, but don't expect that day to come anytime soon. Free-to-play MMOGs are a relatively new development in the Western videogame market. It was big news a year ago when Dungeons & Dragons Online made the transition but it turned out to be a smart move: Turbine revealed in February that despite being "free," DDO revenues had increased by an amazing 500 percent, while the player base had doubled. That success gave the game a new lease on life and may well have figured into the decision, revealed earlier this month, to do the same with Lord of the Rings Online. Could World of Warcraft, the industry's undisputed big dog, someday make the same switch? 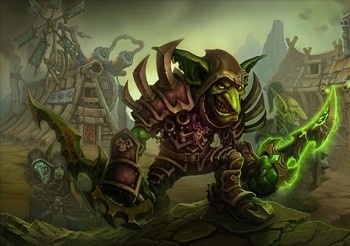 It's definitely possible, according to World of Warcraft Lead Designer Tom Chilton, but not until another game manages to make a serious play for WoW's crown. "I feel like [free-to-play games] are doing that to compete with other games that are on a similar subscriber level to what they were at," he told PC Gamer. "I imagine that when one of them went free to play it cannibalized some of the other subscribers." "I can definitely imagine that being the case with World of Warcraft. If another game comes along and blows us away it may not make sense for us to have a subscription fee," he continued. "Or even further down the line, when we have another MMO out." Don't expect that to happen anytime soon, however. World of Warcraft is still a hugely successful endeavor, responsible for well over half of Activision's operating profit, and Blizzard has no interest in messing with it. "We're not spending a lot of time thinking about it," Chilton said. "It's not something that's a reality for us in the near future."